I did this walk over several years, during period visits to Oxford for my work. 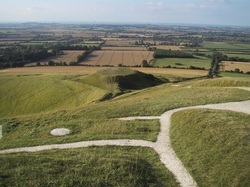 It starts at Overton Hill near the Aylesbury stone circle and continues along the chalk ridges to Ivinghoe Beacon. 9 miles, took 3.5 hours. There was a lovely sunset. Transport connections were terrible. Had dinner in an Aussie bar. The trail was easy. Had a late but wonderful dinner at the Blowing Stone Inn in Kingston Lisle. Stayed overnight at the Blowing Stone Inn. Walked with Robert and Jennifer, much shorter than expected.